I want to help. I want to share. Period. 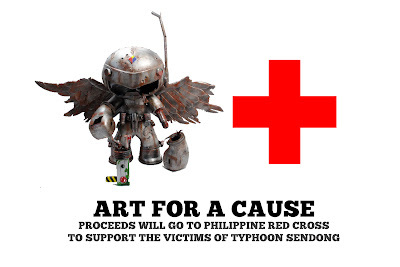 I will transfer the proceeds to Philippine Red Cross. I saw (http://www.redcross.org.ph/donate) they are accepting donations thru bank deposits. This is a silent Auction for my custom toys and if you have some art pieces you want to donate for this cause contact me I will add those here. PM me your max bid. The highest bidder will get the custom toy. Bidding will end December 29, 2011.
International bidders are allowed. Actual dollar cost and shipping cost are indicated in each listing. HEAD OVER TO MY FACEBOOK PAGE AND LIKHANG PINOY CUSTOMS PAGE TO SEE THE CUSTOM TOYS FOR AUCTION.